Remember when I said Prosperity takes some planning? It takes some maintenance too. If you own a car you understand it needs more than gas to run. The oil has to be changed sometimes. The tires need replacing eventually. The brakes wear out. 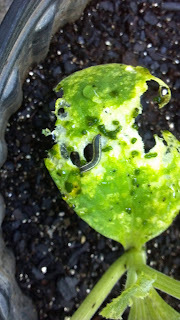 Today I discovered little worms on my six grocery growers out back. TEMPTATION! It's hard to resist the urge to hop over to the farm and get a tablespoon of Dipel - a bacteria (Bt) that kills nothing but worms. So organic. So easy. But if you are doing this project at home on the cheap, buying a Bt product that only kills worms might not be your best investment. There will be other bugs eventually and Bt won't kill them. Unless they are worms. Liquid hand soap in a spray bottle. The ratio would be approximately 2 tablespoons to a gallon, but I'm using a little spray bottle. Just squeeze some in. Enough to kill bugs but not enough to burn the plant's leaves. If you burn them, they won't look good, but the plant usually outgrows the damage. Boil some crushed garlic and hot peppers, then strain it through some fabric. If you don't, it will clog your spray bottle. Then add the hand soap. Add some potato starch if you have it, corn starch if you don't. You can boil a smooshed potato with the garlic and pepper if you don't have either. This is going to make the solution sticky so the bugs can't escape easily. Only the leaves get sprayed, top and bottom. It won't hurt to spray the flowers but that is not where the bugs usually are. The plants will probably need to be sprayed a few times over a week to kill all the little critters you missed, the newly hatched and the newly landed. This works best on soft-bodied bugs like caterpillars and aphids. If you have beetles or hard-shelled bugs, expect to pay.